When we think about the end of slavery in the United States many of us think about the Emancipation Proclamation or Robert E. Lee's surrender to Ulysses S. Grant at Appomattox on April 9, 1865. At that point, Lincoln's proclamation, issued two years prior in 1863, went into effect for the ten states that had initially seceded from the Union, though slavery would remain legal in 2 states, Delaware and Kentucky, until the passage of the 13th amendment. However, those enslaved in Texas would not officially hear the good news of freedom until June 19, 1865. 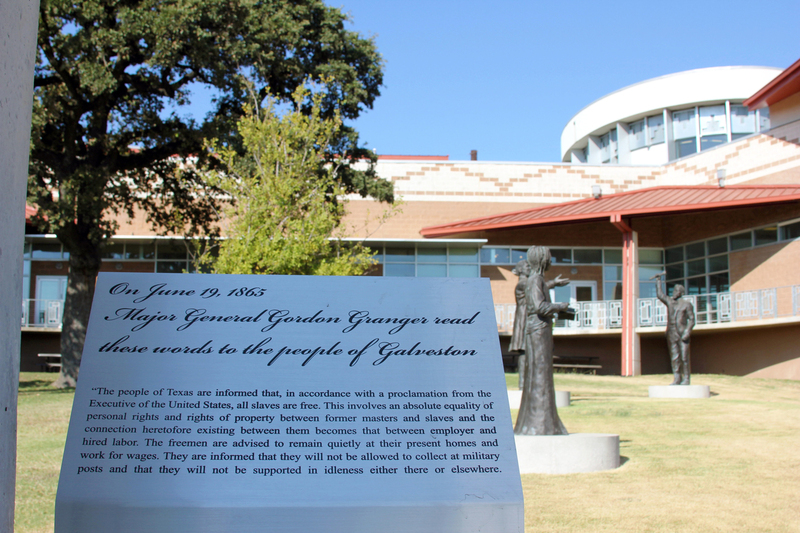 This pronouncement was made by General Gordon Granger, from the steps of the Galveston court house, reading General Order No. 3. The people of Texas are informed that, in accordance with a proclamation from the Executive of the United States, "all slaves are free." This involves an absolute equality of personal rights and rights of property between former masters and slaves, and the connection heretofore existing between them becomes that between employer and hired labor. The freedmen are advised to remain quietly at their present homes, and work for wages. They are informed that they will not be allowed to collect at military posts, and that they will not be supported in idleness either there or elsewhere. Now, African American communities across the country celebrate June 19, known as "Juneteenth," to mark the beginning of freedom. It commemorates the first step in the larger dream of independence and justice that, for many, is still not fully realized. 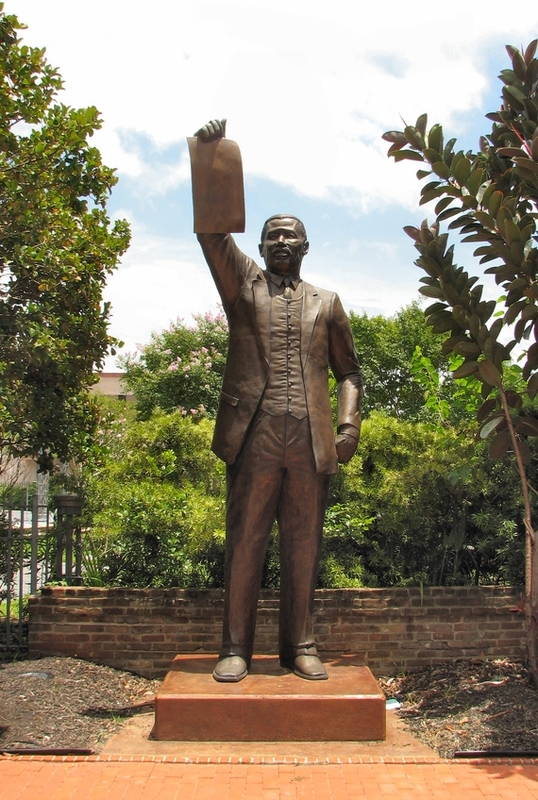 This 9 foot tall bronze statue of Governor Al Edwards in Ashton Villa, Texas, to commemorate the 1979 passage of legislation by Edwards making June 19th a Texas state holiday. 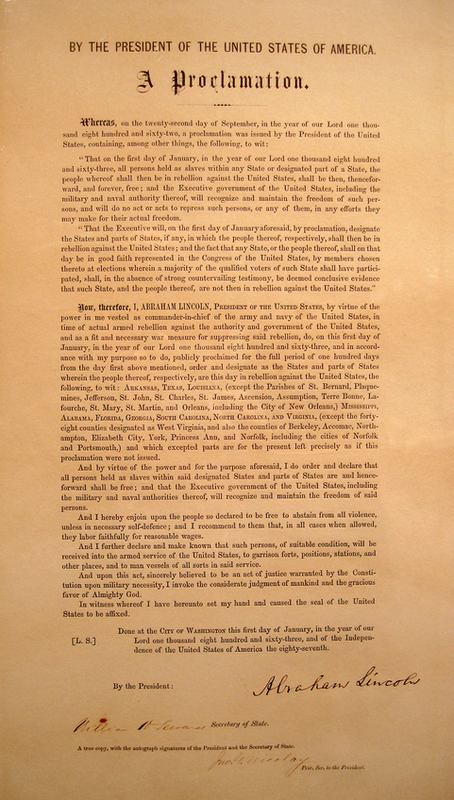 The successful passage of this bill marked Juneteenth as the first emancipation celebration granted official state recognition. Flickr. The first Juneteenth celebration took place in Texas in 1865. and involved eating, drinking, and celebrating a reality that ancestors had hoped, prayed, and fought for. The next year, the newly freed population in Texas celebrated again on June 19. In the coming years, different traditions became commonplace at Juneteenth celebrations throughout the South: strawberry soda and barbeque remain culinary staples, and rodeos and baseball are still highly-anticipated day-of activities, while some former slaves and descendants make an annual pilgrimage back to Galveston, Texas. Early Juneteenth celebrations across the country often involved reading the Emancipation Proclamation, musical performances, and sermons extolling the importance of education as a vehicle to remember the past and keep watch over the present. 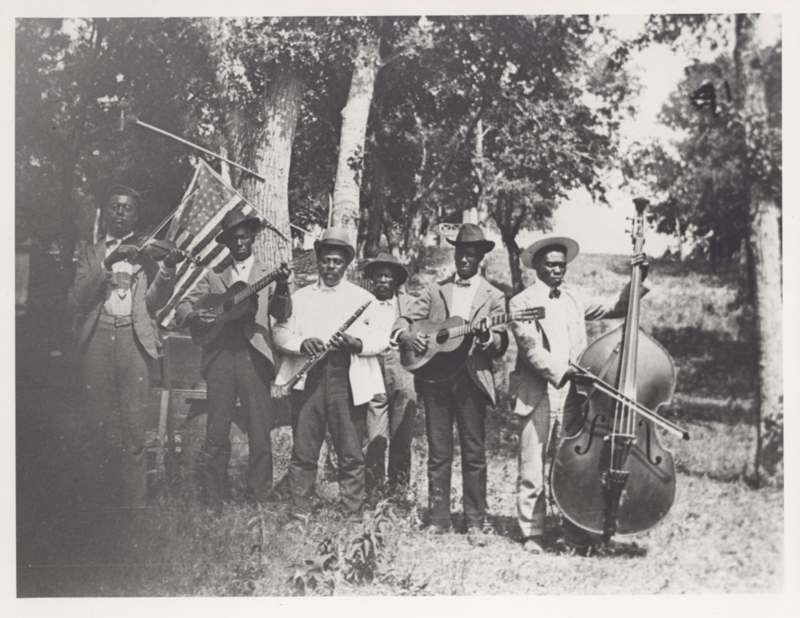 Juneteenth celebration band, 1900. Wikimedia Commons. During the Civil Rights era Black Codes and Jim Crow laws attempted to prevent African American communities from celebrating Juneteenth. To combat these restrictions, individuals purchased land and created parks where the celebrations could be held. African Americans continued to spread the tradition and the celebration as they moved out of Texas into larger cities and states during the Great Migration. In 1968, Juneteenth received a strong resurgence through Poor Peoples March to Washington D.C. Many attendees returned home and initiated Juneteenth celebrations in areas previously absent of such activity. In fact, two of the largest Juneteenth celebrations founded after this March are held in Milwaukee, WI, and Minneapolis, MN. It wasn't until January 1, 1980, that Juneteenth became an official state holiday in Texas. The successful passage of this bill marked Juneteenth as the first emancipation celebration to be granted official state recognition. Juneteenth monument located in Austin, Texas. Wikimedia Commons. Juneteenth has made its way throughout the United States and is now celebrated widely across the country. In Virginia, the celebrations span from southwest to the eastern shore, with many communities across the commonwealth sponsoring local events. In 2007, Juneteenth was recognized as a statewide holiday from the Virginia State Government by Delegate Frank Hargrove, 27 years after it earned the designation in Texas. Hargrove introduced the Virginia Juneteenth State Holiday Observance Resolution, and for the past 11 years, the third Saturday in June has officially been an observed holiday by the Commonwealth. 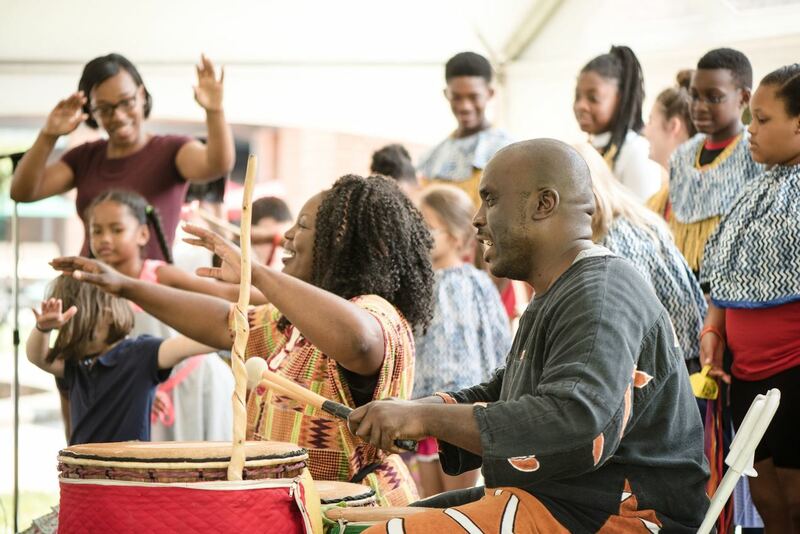 In 2006, a year before the Virginia state resolution was passed, Orange, VA held its first Juneteenth celebration as a partnership between the Orange County African American Historical Society (OCAAHS), and The Arts Center In Orange (ACO). 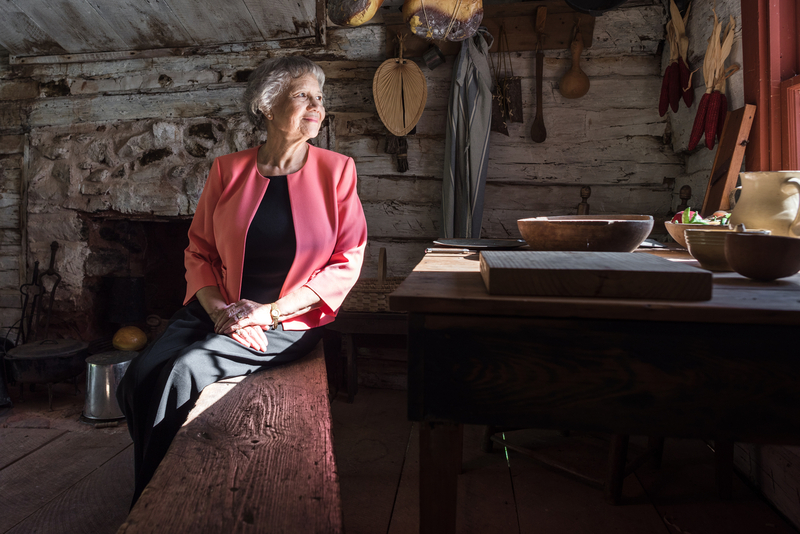 Montpelier descendant and founding president of the OCAAHS, Rebecca Gilmore Coleman in her great grandfather, George Gilmore's cabin. Gilmore, thought to be enslaved at Montpelier, built the cabin across the street from Montpelier after emancipation. Over the years OCAAHS has sponsored community genealogy workshops, lectures, and other opportunities for people to learn about African American history in Orange and the surrounding area. 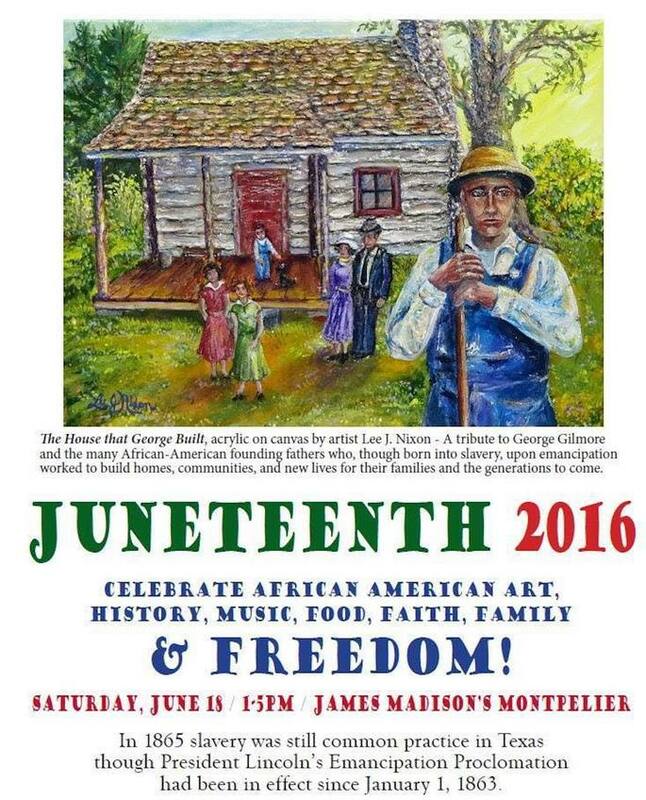 Juneteenth has been one of its main events since 2006, in conjunction with the ACO. The ACO is led by Laura Thompson, who, with Coleman, had attended a Juneteenth celebration in Charlottesville and decided it was time to “bring the celebration home to Orange,” and “educate the local community as to what Juneteenth is all about.” Thompson and Coleman worked closely to organize Black History Month exhibits at the ACO in years prior, and decided to team up again to organize a Juneteenth event centered around celebration and education. Young attendees at Juneteenth 2016 listen to master storyteller Sheila Arnold. The first Juneteenth Celebration in Orange, VA, took place at the local Arts Center. Local artists, like Darrell Rose, displayed their work and there were performances by local bands and choirs. In 2007, the celebration moved to the park across from the Arts Center, and the program added a long time favorite: the Shady Grove Baptist Church Men’s choir. Between 2006 and 2015 Juneteenth was held annually, but moved relocated to a variety of different locations throughout the community (including Robertson Memorial Park and the Orange Volunteer Fire Department Fairgrounds), as it grew in size and reputation, all the while searching for a more permanent home. 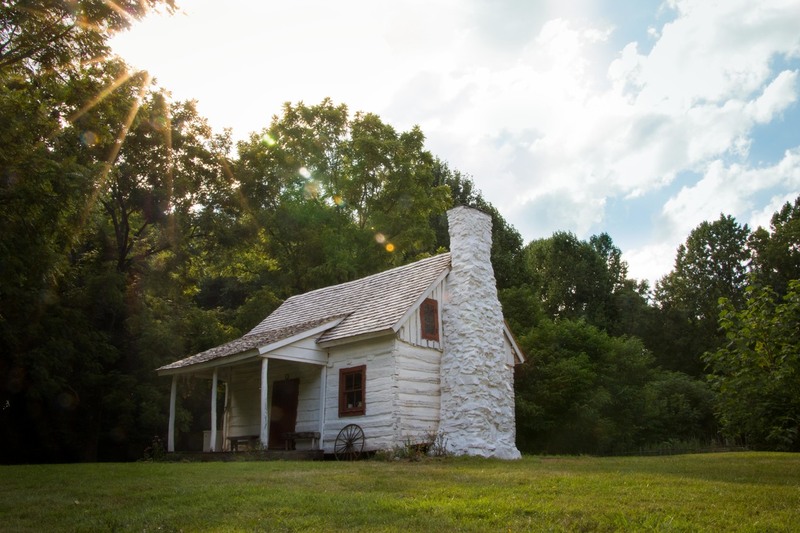 Down the road from these annual Juneteenth celebrations sits James Madison's Montpelier, the home of 4th President, James Madison. Over the last 20 years, Montpelier has been working locally and nationally to illuminate the humanity of those who were enslaved by the Madison family, through ongoing descendant engagement, interpretation and archaeology, oral history, and its new permanent exhibition, The Mere Distinction of Colour. Matt Reeves, Montpelier’s Director of Archaeology, had long been involved with OCAAHS, and had met Coleman in 1999 when she informed Montpelier about her grandfather's cabin across from the Montpelier property. It was Coleman who urged Montpelier to restore her ancestral cabin and has since been an advisor on many of Montpelier's African American history initiatives. The Gilmore Cabin. Jenn Glass. The Montpelier Foundation. Finally, in 2016, Reeves proposed that OCAAHS, the ACO, and James Madison's Montpelier form a partnership to host the first annual Juneteenth celebration at Montpelier. This, in fact, was the first and only Juneteenth to be hosted at a presidential home in the state of Virginia. Many would view holding Juneteenth at a place where people were enslaved to be a contradiction. However, it is this collaboration between Montpelier and the Orange community that has made this event powerful. In fact, many people in Orange’s African American community can trace their ancestry back to Montpelier or adjacent plantations. 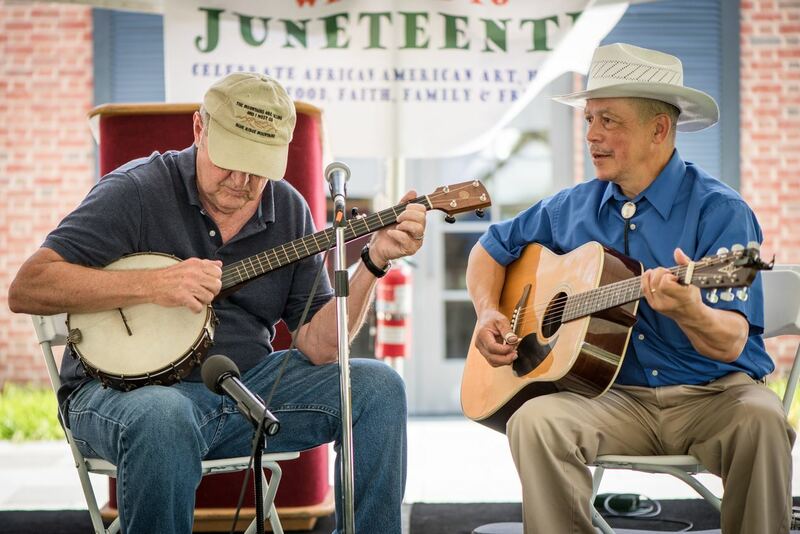 Joel Tate (left), and Jeff Scott perform at the 2017 Juneteenth celebration at James Madison's Montpelier. Eduardo Montes-Bradley. The Montpelier Foundation. "We are honored but also humbled to be hosting again Juneteenth at Montpelier," says Kat Imhoff, President & CEO of Montpelier. "As an organization committed to telling a complete American story, including the parts that make us uncomfortable, it is imperative that we continue to collaborate with our active descendant community. We are grateful for their willingness to share their stories and insights with us and look forward to hosting Juneteenth celebrations in the years to come." LaQuita Marie Staten and Corey Staten of Atumpan - The Talking Drums performing with kids from the Boys & Girls Club of Orange. Eduardo Montes-Bradley. The Montpelier Foundation. "Having the OCAAHS see Montpelier as a homeplace for its Juneetenth celebration marks a sea change in the identity of Montpelier to the local community," says Reeves. "Instead of only being a place of former enslavement, it is also a place where we now celebrate African American history and honor those who sacrificed to create the ideals of liberty." The collaborative nature of this event represents the commitment shared throughout the community of celebrating freedom for everyone. "We are grateful for their willingness to share their stories and insights with us and look forward to hosting Juneteenth celebrations in the years to come." Eduardo Montes-Bradley. The Montpelier Foundation. Coleman reminds us of the importance of the celebration and the power of place. "Well, we are telling the complete American story," she says, flashing a grin. "The good and the ugly." This event is co-sponsored by the Orange County African American Historical Society and The Arts Center in Orange, and funded by the African American Cultural Heritage Action Fund of the National Trust for Historic Preservation with support from The JPB Foundation and the Doris Duke Charitable Foundation.